, an eminent scholar of the middle age, was born in an early part of the ninth century. The most common account of him is, that he was a native of Ayr, in Scotland, though some writers have said that the place of his birth was Ergene, on the borders of Wales, and others have contended that he was an Irishman. It is, we apprehend, most probable that he was a Scotchman. However this may have been, he was animated, in a very dark period, with a most uncommon desire of literature. 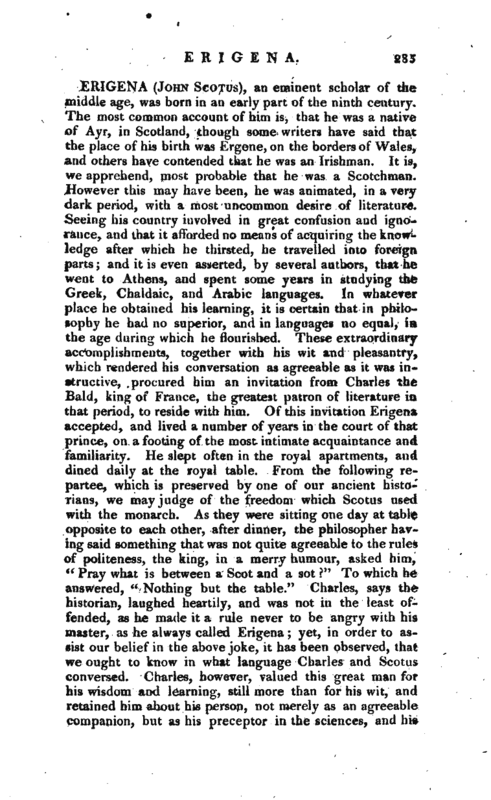 Seeing his country involved in great confusion and ignorance, and that it afforded no means of acquiring the knowledge after which he thirsted, he travelled into foreign, parts; and it is even asserted, by several authors, that he went to Athens, and spent some years in studying the Greek, Chaldaic, and Arabic languages. In whatever place he obtained his learning, it is certain that in philosophy he had no superior, and in languages no equal, in. the age during which he flourished. These extraordinary accomplishments, together with his wit and pleasantry, which rendered his conversation as agreeable as it was instructive, procured him an invitation from Charles the Bald, king of France, the greatest patron of literature in that period, to reside with him. Of this invitation Erigena accepted, and Jived a number of years in the court of that prince, on a footing of the most intimate acquaintance and familiarity. He slept often in the royal apartments, and dined daily at the royal table. From the following repartee, which is preserved by one of our ancient historians, we may judge of the freedom which Scotus used with the monarch. As they were sitting one day at table opposite to each other, after dinner, the philosopher having said something that was not quite agreeable to the rules of politeness, the king, in a merry humour, asked him, “Pray what is between a Scot and a sot” To which he answered, “Nothing but the table.” Charles, says the historian, laughed heartily, and was not in the least offended, as he made it- a rule never to be angry with his master, as he always called Erigena; yet, in order to assist our belief in the above joke, it has been observed, that we ought to know in what language Charles and Scotus conversed. Charles, however, valued this great man for his wisdom and learning, still more than for his wit, and retained him about his person, not merely as an agreeable companion, but as his preceptor in the sciences, and his | best counsellor in the most arduous affairs of governnfenf. While Scotus resided in the court of France, he composed, at the desire of his royal patron, a number of works, which procured him many admirers on the one hand, and many adversaries on the other. The clergy, in particular, were dissatisfied with some of his notions, as not being perfectly orthodox. One of the subjects which employed his pen was the doctrine of predestination. In his treatise on this subject, which was addressed to Hincmar, archbishop of Rheims, and Pardulus, bishop of Laon, the position he begins with is, that every question may be resolved by four general rules of philosophy, viz. division, definition, demonstration, and analysis. By these rules he endeavours to prove, that there cannot be a double predestination, of one to glory, and another to damnation; and that predestination does not impose any necessity, but that man is absolutely free; and that, although he cannot do good without the grace of Jesus Christ, yet he does it, without being constrained or forced to do it by the will of God, by his own free choice. Sin, and the consequences of it, and the punishments with which it is attended, are, says Erigena, mere privations, that are neither foreseen nor predestinated by God; and predestination hath no place but in those things which God hath pre-ordained in order to eternal happiness; for our predestination arises from the foresight of the good use of our free-will. Sentiments so bold, and delivered in such an age, could not fail of exciting great indignation. Wemlo, or Ganelo, archbishop of Sens, having read the work, collected out of it several propositions, which he arranged under nineteen heads, according to the number and order of the chapters of Scotus’s treatise, and sent them to Prudentius, bishop of Troyes. This prelate, having examined them, found in them, as he thought, not only the errors of Pelagius, but the impiety of the Collyridians. He employed himself, therefore, in answering Erigena and another answer to him was written by Florus, a deacon of the church of Lyons. It does not appear that Scotus engaged any farther in the controversy. Another of his works was upon the subject of the eucharist, in answer to a famous book of Paschasius Radbertus, concerning the body and blood of Christ. Upon this head, Erigena had the good sense to oppose the doctrine of transubstantiation. | While our author was employed in these discussions, an incident occurred, which drew upon him the displeasure of the Roman pontiff. Michael Balbus, the Greek emperor, had sent, in the year 824, a copy of the works of Dionysius, the philosopher, to the emperor Lewis the pious, as a most acceptable present. In France these treatises were esteemed to be an invaluable treasure; and therefore Charles the bald, who could not read Greek, was earnestly desirous of perusing them in a Latin translation. This desire was undoubtedly increased by an opinion which at that time universally prevailed, though without any proof, that Dionysius the Areopagite, or St. Denys, was the first Christian teacher, or apostle, in France. 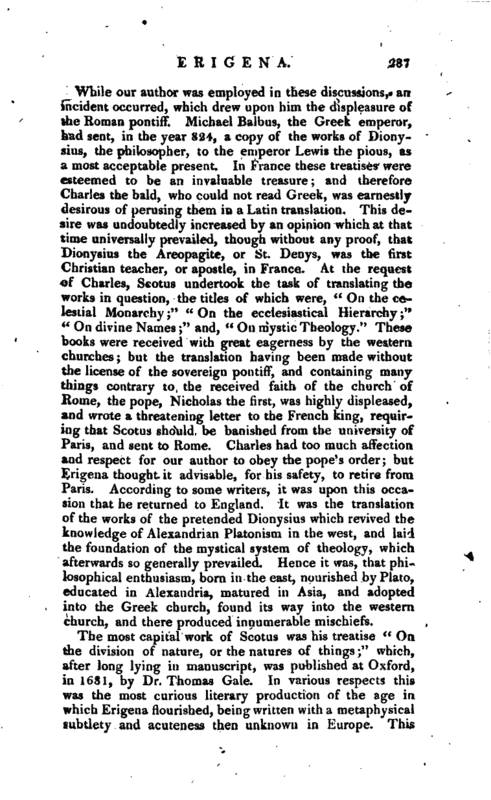 At the request of Charles, Scotus undertook the task of translating the works in question, the titles of which were, “On the celestial Monarchy;” “On the ecclesiastical Hierarchy;” “On divine Names;” and, “On mystic Theology.” These books were received with great eagerness by the western churches; but the translation having been made without the license of the sovereign pontiff, and containing many things contrary to the received faith of the church of Rome, the pope, Nicholas the first, was highly displeased, and wrote a threatening letter to the French king, requiring that Scotus should be banished from the university of Paris, and sent to Rome. Charles had too much affection and respect for our author to obey the pope’s order; but Erigena thought it advisable, for his safety, to retire from, Paris. According to some writers, it was upon this occasion that he returned to England. It was the translation of the works of the pretended Dionysius which revived the knowledge of Alexandrian Platonism in the west, and laid the foundation of the mystical system of theology, which afterwards so generally prevailed. Hence it was, that philosophical enthusiasm, born in the east, nourished by Plato, educated in Alexandria, matured in Asia, and adopted into the Greek church, found its way into the western church, and there produced innumerable mischiefs. The most capital work of Scotus was his treatise “On the division of nature, or the natures of things;” which, after long lying in manuscript, was published at Oxford, in 1681, by Dr. Thomas Gale. 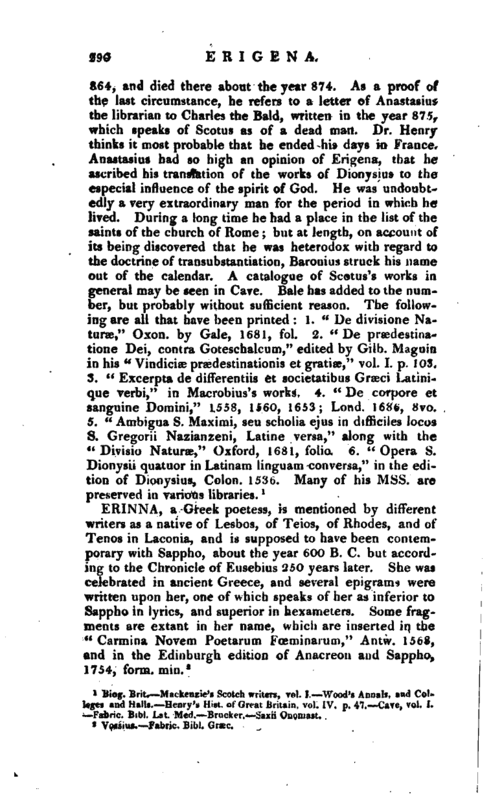 In various respects this was the most curious literary production of the age in which Erigena flourished, being written with a metaphysical subtlety and acuteness then unknown in Europe. 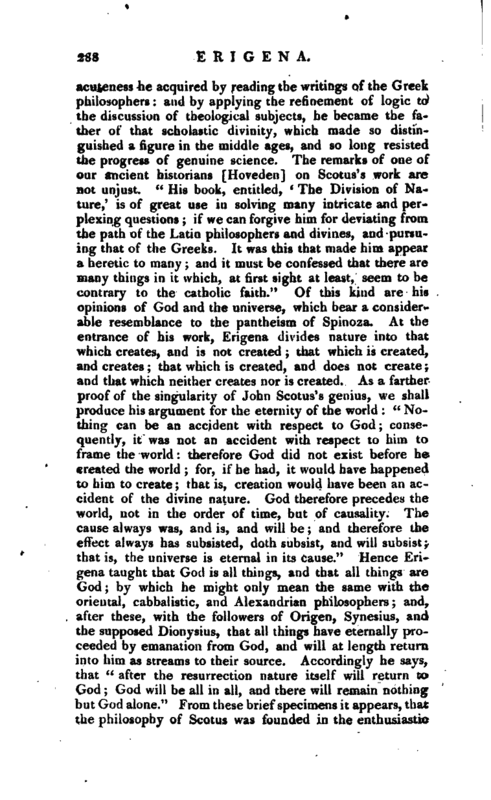 This | acuteness he acquired by reading the writings of the Greek philosophers: and by applying the refinement of logic to the discussion of theological subjects, he became the father of that scholastic divinity, which made so distinguished a figure in the middle ages, and so long resisted the progress of genuine science. The remarks of one of our ancient historians [Hoveden] on Scotus’s work are not unjust. “His book, entitled, `The Division of Nature,' is of great use in solving many intricate and perplexing questions; if we can forgive him for deviating from the path of the Latin philosophers and divines, and pursuing that of the Greeks. It was this that made him appear a heretic to many; and it must be confessed that there are many things in it which, at first sight at least, seem to be contrary to the catholic faith.” Of this kind are his opinions of God and the universe, which bear a considerable resemblance to the pantheism of Spinoza. At the entrance of his work, Erigena divides nature into that which creates, and is not created that which is created, and creates that which is created, and does not create and that which neither creates nor is created. As a farther proof of the singularity of John Scotus’s genius, we shall produce his argument for the eternity of the world “Nothing can be an accident with respect to God consequently, it was not an accident with respect to him to frame the world therefore God did not exist before he created the world for, if he had, it would have happened to him to create that is, creation would have been an accident of the jdivine nature. God therefore precedes the world, not in the order of time, but of causality. The cause always was, and is, and will be; and therefore the effect always has subsisted, doth subsist, and will subsist; that is, the universe is eternal in its cause.” Hence Erigena taught that God is all things, and that all things are God by which he might only mean the same with the oriental, cabbalistic, and Alexandrian philosophers and, after these, with the followers of Origen, Synesius, and the supposed Dionysius, that all things have eternally proceeded by emanation from God, and will at length return into him as streams to their source. Accordingly he says, that “after the resurrection nature itself will return to God; God will be all in all, and there will remain nothing but God alone.” From these brief specimens it appears, that the philosophy of Scotus was founded in the enthusiastic | notions of Universal deification; and consequently, that he is rather to be ranked among the fanatical than among the atheistical philosophers. The monastic life, which then so generally prevailed, afforded so much leisure for indulging the flights of imagination, and so many opportunities for an ostentatious display of piety, that it was peculiarly favourable to the propagation of enthusiasm. To this it may be added, that the ignorance of the times made it perfectly easy for those, who were inclined to practise upon vulgar credulity, to execute their design. It is not, therefore, surprising, that the dreams of mysticism should be extensively propagated, under the authority of a supposed apostolical name. Biog. Brit.—Mackenzie’s Scotch writers, vol. 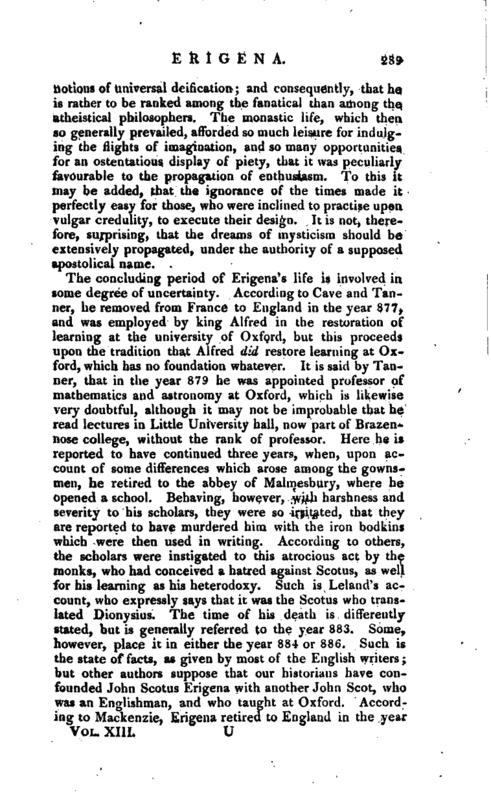 I.—Wood’s Annals, and Colleges and Halls.—Henry’s Hist. of Great Britain, vol. IV. p. 47.—Cave, vol. I.— Fabric. Bibl. Lat. Med.—Brucker.—Saxii Onomast.